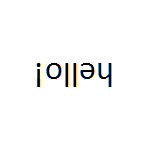 This is a just-for-fun tool to flip your text 180 degrees. The text can be letters, numbers, and several symbols. You also can share it on Twitter, Facebook, MySpace, and other websites which is support several extra Unicode and note that not all websites support extra Unicode. Copy and paste the result to any websites you desire. For example, try to paste it onto Facebook or Twitter status.